A few days before our first son, Jonah, was born, my cousin Danny died of cancer at 52. So when it came time to give Jonah his Hebrew name, with the consent of my cousin Diane — Danny’s widow — we named him in part after Danny. 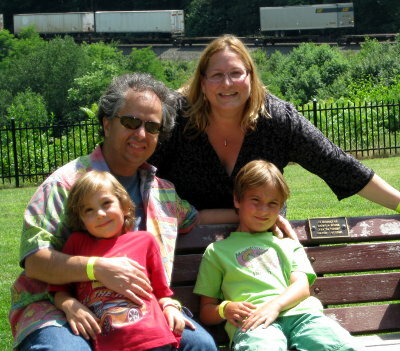 Danny was an Amtrak employee and a lifelong lover of trains. What we didn’t know when we chose his name for Jonah was that his favorite place in the whole world to watch trains was Horseshoe Curve in Altoona, Pennsylvania — just minutes from where my wife grew up and where my in-laws still live. He loved it so well that he wrote online articles about his love of trains under the pseudonym Al Tuner. After Danny died, a bench was dedicated in his memory in the spot where (we only recently learned) he would sometimes sit all through the night, waiting for trains to trundle by, brakes asqueal, jotting down their engine numbers in a notebook. Last week, during our trip to see Andrea’s family, we finally taught Jonah and Archer the significance of their Hebrew names and visited Horseshoe Curve and Danny’s bench. Fittingly, a train trundled by, brakes asqueal, as this picture was taken.